The Holiday R.V. Advantage - The Closer You Look, The Better We Look! Fleetwood Motorhomes by Fleetwood R.V. Coleman Travel Trailers & 5th Wheels by Thor Industries Inc.
Fun Finder & Shadow Cruiser Ultra Lite Travel Trailers by Cruiser R.V. Chaparral 5th Wheels by Coachmen R.V. Stryker Toyhauler Travel Trailers by Cruiser R.V. At Holiday RV Sales & Service in Jefferson, Iowa, you will get the personal, friendly, small-town treatment you want and deserve. 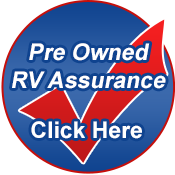 Before you buy, check out our selection of New and Pre-owned RV's. HOLIDAY RV IS YOUR FULL SERVICE RV DEALER FOR SALES, SERVICE, PARTS AND WARRANTY REPAIRS.